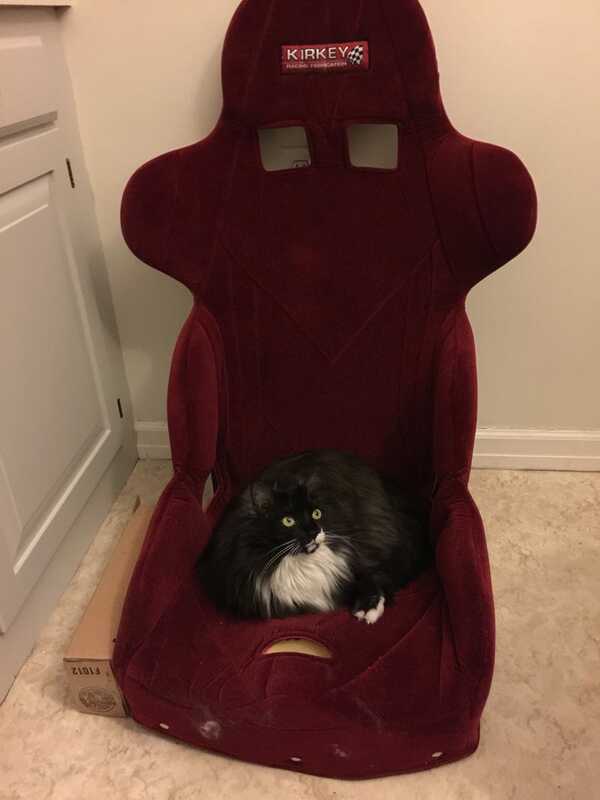 So I am installing this burgundy velour Kirkey road race seat in my focus st for Autocross. I’m tall and the leather st3 recaro has me too close to ceiling with my helmet. I’ll be able to more safely use 4 or now if I like 5/6 point harnesses. I look forward to a less restrictive seating position! Until I get my sparco seat base, my cats have taken control. Small black cat (Charlie) apparently gets territorial with it. And Two-Two big Forrest cat sleeps there now no matter where we move the seat. Problem is that velour is the same stuff on those pet hair removal brushes, it is covered in hair.